I could care less about golf. Really. Normally it bores me. But I am passionate about how professional athletes–and other public figures–act. And I’m always curious about how they spend their time outside of the limelight, and how their actions are examples–positive or negative–for those who look up to them. Well, this story is about someone in the limelight, and his actions took place in the limelight. But still, it’s a great story, about an unknown golfer who could have won his first PGA tournament… but called a penalty on himself, and lost the tournament. Admirable. Worthy of respect. I like to read about this kind of honesty and truthfulness in public figures. I like to read and hear about this kind of honesty and truthfulness in non-public figures, too. It makes me think. Check it out. Here are some more photos… obviously, we love this brown corduroy outfit! 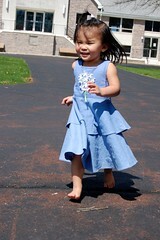 It’s a hand-me-down from friends, and Kajsa’s worn it twice in the past two weeks. So fun. It’s been cold lately, here in Harleysville. Brrr.. so tonight when Kajsa and I went out to play we had to bundle up. No photos of our hockey “game”, as I was on roller blades.. and didn’t want to risk dropping the camera. on the way to church. I've posted a photo from the other direction--looking towards home from church. Now, looking from home towards church. I know, it’s after Easter. But I did take the photo on Good Friday–kind of. A bit after midnight, but still Good Friday in Chicago. 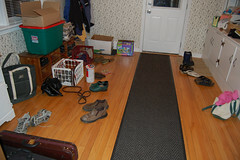 The photo is of everyone’s shoes in our mudroom. We waited on Friday… waited for my parents and younger sister, then waited for my oldest sister, brother-in-law, and nephew. Waiting around for company who has never been at your house before unsettles me. Until they all arrived, I wasn’t completely at peace. Once the door was locked, the guests were in their beds, and the lights began to be turned off… then I felt at peace. And the words “it is finished”… came to mind. Jesus’ final pre-resurrection act on earth—dying on the cross, for us..–is a much greater act of love and sacrifice than waiting for company to safely arrive from their destinations. Yet I thought about it, when I saw this room and took the photo. it’s much more than hospitality, it’s much more than waiting… it’s the ultimate act of love that I can hardly even imagine. And yet Christ did it.